Well it’s been over a month since the last post and I’m a little rusty with the writing and art. I moved house and its been a whirlwind of activity, leaving creativity a long way behind. The thought of Pinto Rapido has galvanized me back to the watercolour paper and I’ve been dragging my thoughts into the art world. 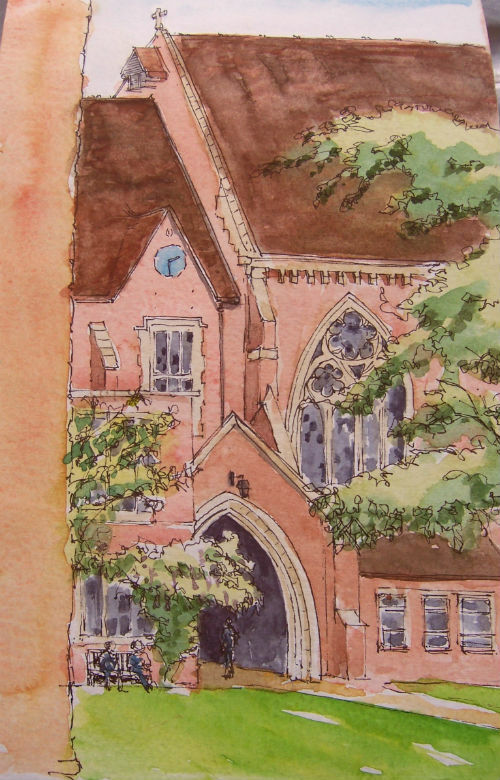 I took my small sketchbook to a Tango Festival (yes dancing has not been forgotten) in Sussex and had 90 minutes between workshops. It was a cool and cloudy day but I picked a spot out of the wind and where I could see the archway. The wisteria was in bloom and the trees in leaf. Stronger shadows would have been useful. I wanted the sketch to have an unfinished look but then forgot, so its a little too colourful. I’ve been thinking about the subject of the Pinto painting and looking on Google maps. 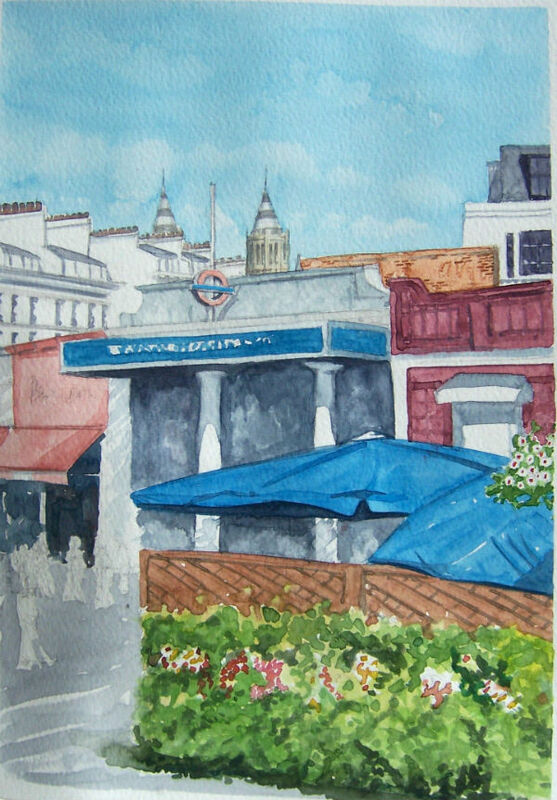 I had thought I would paint South Kensington station and so set about finding a better view than my previous effort. I got closer to the station with this attempt but then lost heart as I realised I had made the dark interior the focal point. Also the marks were not in scale and colours too intense. Not a good start! 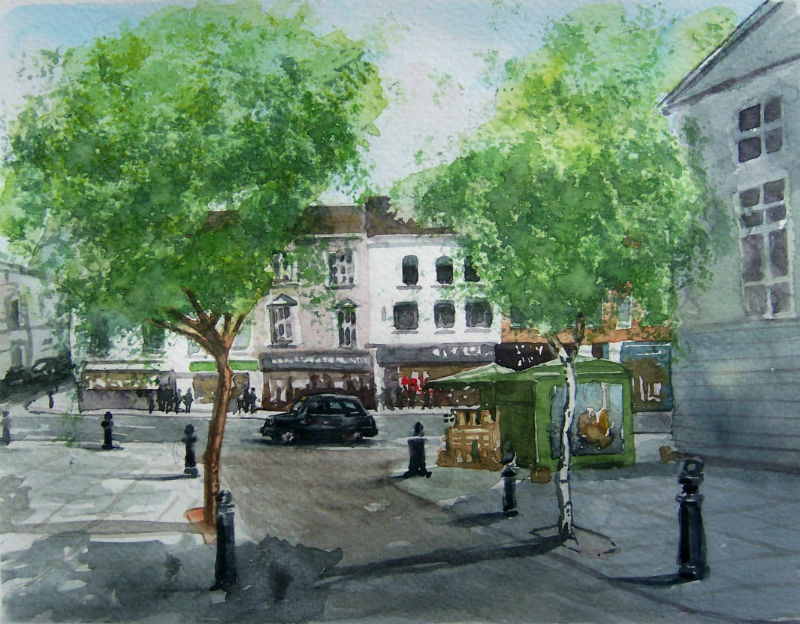 My next thought was to try doing a series of small sketches, similar to the one I had created in Porto. I can produce these in good time and they don’t take long to colour. It would make the day more interesting and a group could look attractive. Also, when I showed my paintings recently I received more interest from my sketches than my watercolours. 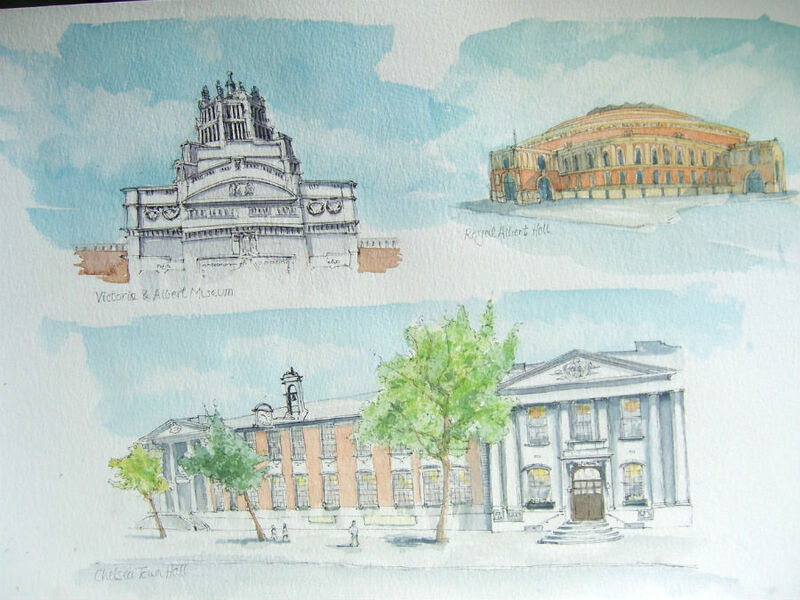 This seemed a bit of a cop-out as I would really like to show a watercolour and I’m not sure the grouping is that great. So I looked on Google again and found a place I could sit, near to the Town Hall. 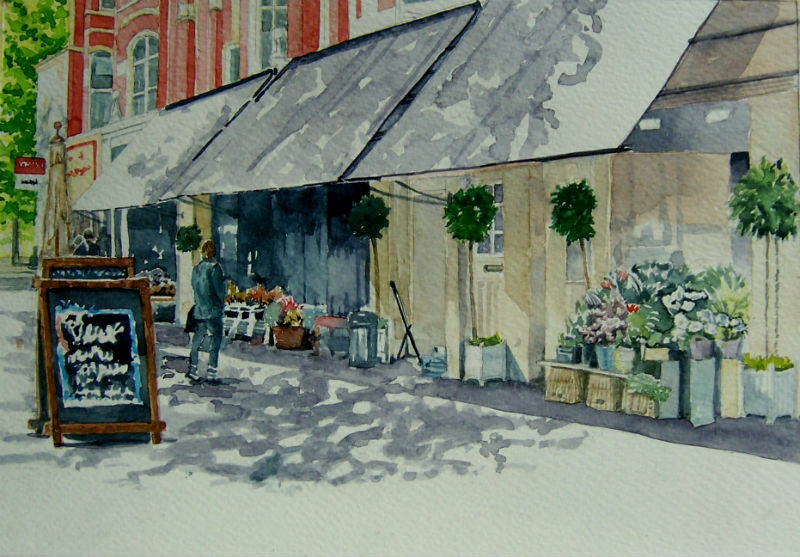 Its a street scene and has traditional shops and taxi that would symbolize Chelsea. I wasn’t in the best of moods when I did this and its all gone a bit sludgy. Also the Taxis is central to the picture and it should be on the left coming into the painting. The trees are too similar and the view too ‘straight on’. I needed another view with light, perspective, interest and softer colours. Looking on the web I found a picture of a row of shops on the Kings Road. I liked the light and the subject appealed. I’m pleased with this painting. It has balance, focus, interest, light and dark, perspective and a range of colours. Now can I do something like this on the day? Unlikely as painting outside is really difficult. But I’ve learnt a lot creating this painting and hopefully I can repeat some of the skills on the 11th.